This recipe is a great way to use leftover rice. Feel free to use other grains, such as quinoa or millet. The spiciness of gochujang varies across different brands. I recommend adding a 1/2 tablespoon to the rice first and tasting it. If you want more spice, add another 1/2 to 1 tablespoon of gochujang. You can also add 1 or 2 tablespoons of kimchi juice to flavor the rice. In a wok or a large sauté pan, heat 1 1/2 tablespoons of oil over medium-high to high heat. Add the onions and cook until they start to turn translucent, about 2 to 3 minutes. Add the garlic and ginger and cook for 30 seconds to 1 minute, until they start to become fragrant. Add the chopped kimchi and stir until heated through, about a minute. Add the rice, carrots and the light green and white parts of the scallions to the wok. Stir to combine everything. Add the soy sauce, gochujang (if using) and sesame oil, and stir until all the rice has been well coated with all the sauces. Taste the rice. If you want more spice, add another half or full tablespoon of gochujang. Drizzle in a bit more soy sauce if the rice needs more salt. Add the dark green parts of the scallion and stir everything again. Remove rice from heat. In a separate pan, heat 1 tablespoon of olive oil and fry up the 4 eggs. 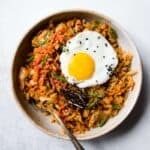 Serve the rice with the fried eggs. Sprinkle some black sesame seeds and nori strips on top, if desired. If you cook rice or grains a lot, consider getting a rice cooker. I love this Instant Pot because it cooks rice in just 12 minutes! It also works as a slow cooker and pressure cooker. In general, the white and light green parts of a scallion take a little longer to cook. That’s why I add them to the wok before the dark green sliced scallions.